Is a diet coke in a pretty glass. 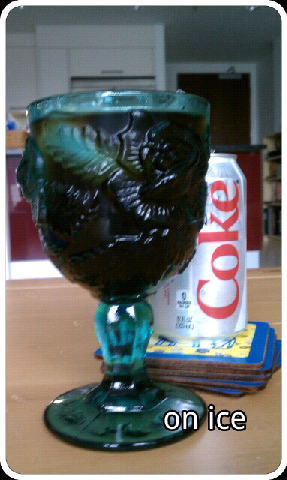 The coke part is OK, and the pretty glass is OK, but diet? Yuck, it always leaves a nasty taste in my mouth. I prefer "The Real Thng"! Actually, I hardly ever drink the stuff, the only pop (soda to you) in my fridge is Club Soda which I mix with orange or cranberry juice and ice for a refreshing summer drink on a hot day. You seem to have suffered a sudden surge in blog posts.... whassup?